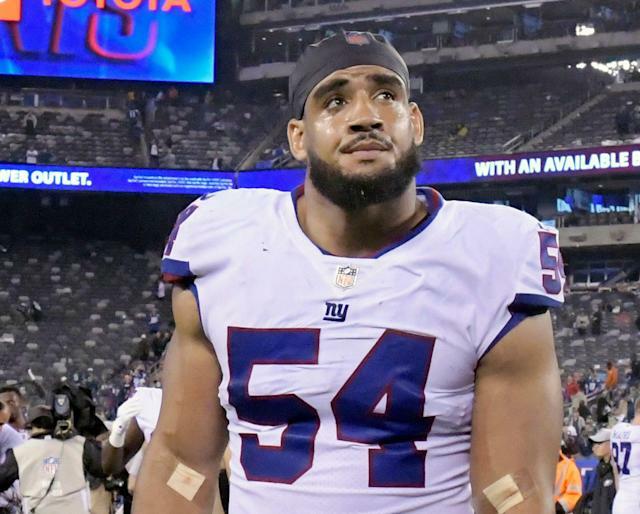 Nearly three years to the day after signing him to a significant free agent contract, the New York Giants are trading defensive end Olivier Vernon. NFL Network and ESPN are reporting that the Giants are sending Vernon to the Cleveland Browns. The trade includes a swap of players: the Browns will acquire Vernon while the Giants will receive offensive guard Kevin Zeitler, as well as a swap of trade picks - New York is sending a fourth-round pick (132nd overall), and Cleveland is sending a fifth-rounder (155th overall). It’s a smart deal for the Giants, who certainly need offensive line help; Eli Manning was sacked 47 times last season. A third-round pick of the Miami Dolphins in 2012, Vernon was one of the big catches of the 2016 free agent cycle. He agreed to a five-year, $85 million deal with the Giants that included $52.5 million in guaranteed money. He started all 16 games in 2016 but missed nine games over the last two seasons with ankle injuries. The Browns now have someone to pair with Myles Garrett to potentially form a formidable pass-rushing duo. Earlier Friday morning, the Browns’ Twitter feed sent out birthday wishes to Zeitler, who is celebrating his 29th. In 2017, the Browns made Zeitler the highest-paid guard in the league, signing him away from the Cincinnati Bengals with a five-year, $60 million contract. Zeitler has started every game over the last four seasons. Heimlich's Mexican League career over before it starts?